Not everyone wants the traditional or fairy-tale wedding. While there is a lot to be said for long flowing white dresses and stately homes, in the modern era, many people are a lot more realistic and open about what they are looking for from their big day. This is a celebration and a great excuse to see people who you haven’t seen in a long time. It is an important ceremony, one that will shape the rest of your life, but equally, weddings are to be enjoyed and commemorated in the best possible manner. This is why there is a growing need for a diverse range of wedding invitations and the Marble wedding invitation from Lucy Ledger Ltd, is a perfect example of a modern, stylish and very fashionable wedding invitation. The pastel colour scheme will dovetail beautifully with many colour schemes, and there is a soft cotton ribbon bow to package the invitation together. As the name suggests, there is a marble backdrop for the invitation, and this may be an excellent choice considering your wedding ceremony venue or the location for your celebration. If there is a great deal of marble on show at one of your destinations, or you stay in an area well known for marble, this is the ideal invitation that adds a personal touch to your invitation. 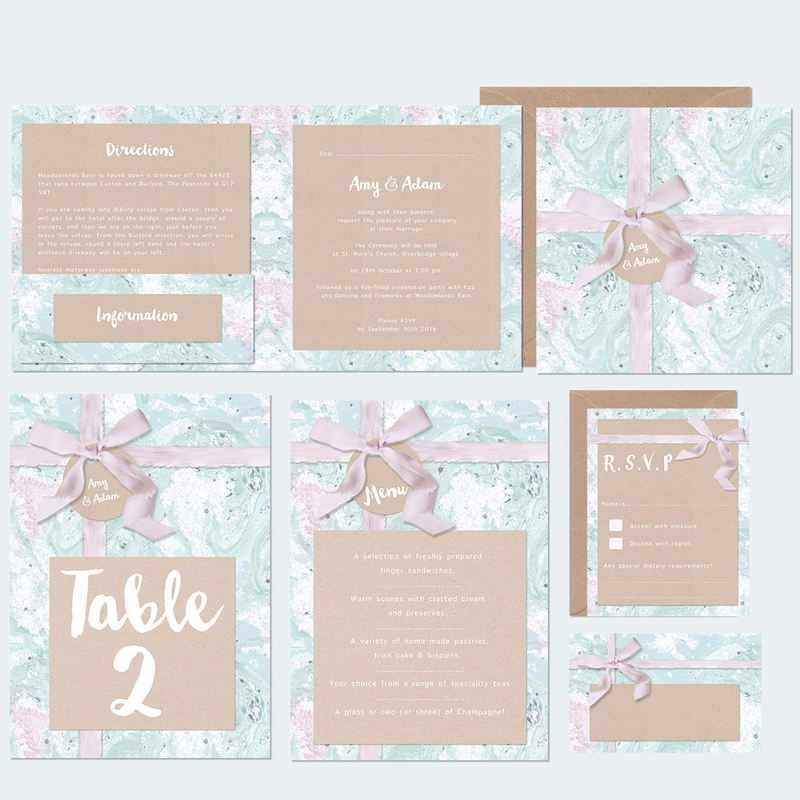 There is a wide range of stationery options and offers for the Marble wedding invitation so if you have a lot to say, you’ll find that you can offer a cohesive and connected range of notes, letters and thank-you cards to all of your guests. The Marble invitation range is instantly eye-catching without being over-powering or too dramatic, making it an ideal invitation for couples who are confident about themselves and their big day.